The State Board of Health was notified by Dr. Modesitt, health officer at Clay City, yesterday that he had met with forcible opposition in his effort to disinfect homes in Clay City and asked for instructions. Dr. Hurty sent instructions to Dr. Modesitt to arrest all the offenders and then to disinfect the homes. 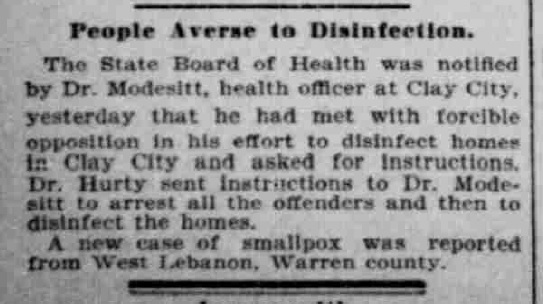 A new case of smallpox was reported from West Lebanon, Warren county. “People Averse to Disinfection,” The Indianapolis Journal (Indianapolis, Indiana), 20 March 1900, p. 8, col. 1; digital image, Chronicling America (http://chroniclingamerica.loc.gov/ : accessed 6 December 2014). This entry was posted in 1900 Smallpox Epidemic, Clay County, Newspaper Clippings and tagged Clay City, Clay County, Dr. J. N. Hurty, Dr. James A. Modesitt, epidemic, Indiana, Indianapolis Journal, Smallpox, Warren County, West Lebanon on January 29, 2015 by Deborah Sweeney.